Gas Monkey GMGC2036D Creeper is a 2 in 1 creeper that is designed to be folded in a "Z" shape for use as a mechanics seat or unfolded for use as a mechanics creeper. With Its thick padded bed, it gives you the extra comfort while getting your job done. 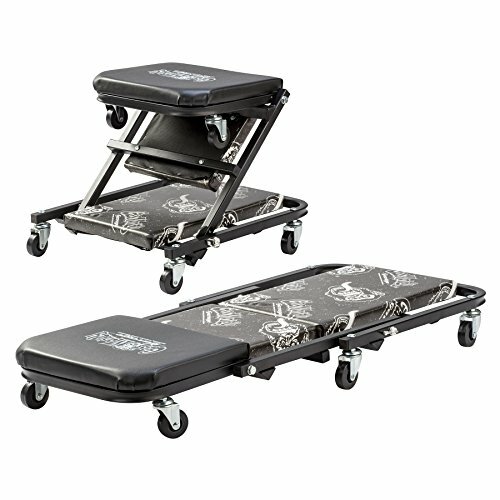 Gas Monkey Z-Creeper features with 6 swivel casters. They provide users with the full mobility and ease of use to get under the tight area. In addition, Gas Monkey C-2036D Creepers is built with the heavy duty frame. It supports up to 300 lbs capacity. If you have any questions about this product by Gas Monkey, contact us by completing and submitting the form below. If you are looking for a specif part number, please include it with your message.